There will be much more to planets than simply being a new backdrop to fight across. The big challenge is finding a role for them. Current thinking is to have planets divided into territories, each one potentially resource-rich pirate-infested, or a manufacturing centre. It'll be interesting to see when this actually rolls out. The fact that CCP has been dead quiet about it since then, most likely means that we won't see this within any short amount of time; 2007, unlikely, 2008, maybe, just maybe. Here's a sneak peak at the next issue of EON, which is shipping on July 7th. As always, I'm excited about this next issue. One thing though that I've had in mind for a number of month now, is to write something up for the next issue. And I keep pushing it to the next one. And the next. I do have got a couple of ideas for articles, but I really have to put myself to it, get some discipline and start working on them instead of just letting go of the thought. Which brings me to ask you this: have you ever thought of writing for a gaming magazine? As amateurs, we're always afraid to take the plunge, anyways I am. But I think this time, I will. If you were to write an article for EON, what would write about? A short story, an article on PVP tactics, or on the political aspects of the corporate and alliance life? I'm curious to know. I think we all are. 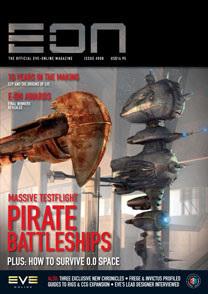 E-ON has featured Testflight since the very first issue, but with Faction ships becoming evermore popular, and more affordable, it seemed the right time to get our ship expert, Farjung, to go into the ins and outs of fitting and using each of the five Pirate Faction Battleships. Until Tech II Battleships arrive, and even after, these ships are seen very much as EVE's high-performance muscle cars, and whilst that fact would hardly be likely to impress a potential mate, the ships are imposing enough to impress a potential enemy. As well as part 4 of our guide to The Second Genesis CCG, Nyphur follows up his previous guide to Rigs with an in-depth look at finding the raw materials required to make them. And if that hasn't got you salivating, how about Ifni's guide to living in the evil realms of 0.0, with its relentless pirates, mired politics and deserts of empty space just waiting to be claimed. Having recently turned 10 years young, we go back to the dawn of EVE to find out how it was during EVE's big bang, the grand ideas, what the development process was like, all the way to the game's first release in 2003. Hellmar on EVE TV, Profiles of FREGE Alliance and INVICTUS, Stavros talks caps, Gnauton and TomB open up and we have three new E-ON Chronicles profiling love, money, lies, betrayal and slavering hounds. Looking forward to this next issue. I'm testing the new feature for polls that in offer for 'Blogger in Draft'. Running a poll on EVE Voice. Yes, I've have noticed that it doesn't seem to work in Firefox, which means that most of you won't be able to participate until the Blogger devs fix the issue. I still want to leave it on so that it can be tested by them, and eventually improved. Hope you'll bare with me until then! Following the suggestion of one Heartless Gamer, I've decided to put all my EVE links in various posts, so that you may easily find them. They're still in the sidebar, and it'll double my update time, since I'll have to update them both in their respective posts AND in the sidebar, but what wouldn't I do for you my readers! EVE-Places.com is a directory of EVE Websites. Well worth the visit! EVE-Mag.com is from the same folks as EVE-Places and full of great articles! Starfleet Comms - Forums, Blogs, Guides and more! Two additional links have been added as a result of some of your comments - Y.A.R.R. Industries and Fatal Alliance. So feel free to let me know of sites I'm missing and I may add them. And finally, if you've got a nice banner for your corporation, or alliance which you'd like to see added to the sidebar, then email me (crazykinux [at] gmail.com) and I'll see what I can do. I mention this, because earlier today, I added the banner link to EVE-Pirate. You gotta love that skull! So I just did a recount of all the lists of EVE sites I've got on in my sidebar, and it comes to 111 as of today! Not bad! I'm always trying to add great looking sites, that show a certain amount of work has gone into them. I hate to simply link to message boards simply for the fact of having a link to this corp or that alliance; unless I feel that it's a corp, alliances, or news site that has a significant impact on EVE. Do I believe I have all the sites listed here, hell no! D'you think I've got an ego THAT big?. I don't think so. Having said that, I need your help. If you come across a site that you judge should be listed here, please let me know. If youe corporation or alliance has a great site, then please list the link in the comments below, and it'll be pleasure for me to link to it. I won't promise that I'll link all the sites that get submitted, but if they fit the (my) requirements, then they'll get listed. So fire away and submit those links. Two hundred links would be a nice number to attain! This was bound to happen at one point in time: Band of Brothers (BoB) lost a titan during a huge battle against Goonswarm. Here's the [long] thread on the eve forums with a video of this greatest of events. Congrats to Goonswarm on this most important achievement. I wonder how BoB will respond? I've been toying with the idea of going to CCP's Fanfest since last year, and have tried to convince the wife that Iceland, despite the name, is a great substitute for a tropical vacation, especially in November. Let me know, and if you've been, feel free to share your experience in the comments. While Tranquility is still down for patch day, head over to the video section and have a look at the new videos [high (1080p), low (720p)]. Sweet lord I could live on these trailers! Speaking of trailers and videos, has anyone of you gotten news from the Evolution crew. I watched it again last night going over all the EVE videosI've downloaded through the years, and damn was I looking forward to that movie! Then there was that article in E:ON, can't remember what issue. But nothing since then. If you know of any new development on the project since then, I'd love to hear from you, as I'm sure others would too. The quality was just astounding and I'd really hate to see this project end without anything coming out of it. Hopefully we'll have some news in the next issue of E:ON. In any case, please let me know! Having made sure I was training a long skill (Motion Prediction to level 5, with 2 days left) while the Revelations II patch was beng applied to Tranquility, I'm currently sipping a Pinnacle ice cider while listening to the EVE soundtrack I won back in early 2006 from EVENews.com. The director of this little gem is christianethic, a mate from the land down under. Head over to his YouTube page for more videos! If you ever come across a really great video, or have made one yourself, then please let me know and I'll be happy to check it out and post it here. See you in EVE after the patch! Book your calendar: this Saturday, June 23rd 2007, EVE TV will launch under its new weekly format. I remember watching the first ever tournament on EVE TV while at work, 2 years ago (is it really 2 years ago!) and going bananas for what was my first experience with live gaming tournaments (and still is). Well it looks like we're in for a good treat. Head over to the Dev Blog to learn more from the Queen of EVE TV herself, Xyliana. I'm particularly looking forward to learning and hearing about in-game news, interviews and real-life events. I'm also looking forward to seeing the new cast they've assembled around spiralJunkie in action. Let's just say they've chosen a most interesting assemblage of hosts. They've got a lot on their hands as the new weekly format will require a lot of content on a regular basis. Not that there isn't enough happening with EVE, but being able to produce a show of the highest quality becomes a challenge in and of itself. With the crew they've put together at MMM Publishing, I'm quite confident they'll meet that challenge. Oh, by the way, if you're looking for fame yourself, they're looking for help! There's a great post discussion over at Cuppytalk on what exactly defines a game and what makes some a virtual world and others not. "All games are virtual worlds, but not all virtual worlds are online games." Not sure that I agree with that quote though. To me a game, whether PC or console, has a start and an end, whereas virtual worlds have neither. In that sense, most games ARE NOT virtual worlds. What's your take on it? The universe is in flux and unless you've been hiding in an asteroid belt somewhere in a far away low sec system you've probably got word of it. Over the last few weeks CCP has been under fire from part of the community over allegations of, dare I say, corruption and political maneuvering within the delicate in-world Eve ecosystem. The most recent allegations have been the most hurtful, whether they a true or not. I first read about it through a CCP dev blog in which they explained that their investigation had found no basis for Goonfleet's accusations - the corporation who had made the accusations. As expected, Goonfleet responded to the dev blog. Story started pupping up on various blogs, but it was my opinion that things would die down over the coming weeks. How naive that was! I then got word through my Google EVE Online alerts of an interesting post over at 3dpointD.com which mentioned that CCP might be introducing some sort of community governance to help prevent future allegations of corruption. And this New York Times article which mentioned the creation of an elected player body (we now know they'll be 9) to be flown to CCP's headquarter to review and make sure that their operations were beyond reproach. I an optimistic. I tend to believe the glass is half full and that CCP's effort demonstrate their willingness to show that they try to be impartial to the best of their abilities. The effort is genuine and I believe, will be well received by the majority of the community. In the meantime, we'll just have to wait until this fall, to see how that goes. And if the player body will truly restore the faith of the community with CCP. I for one am of the opinion that it has a good chance of working.What do you think? No need to call the police, the FBI, the RCMP or MI6 for that matter. I'm back after a 2 week absence, traveling the old country, land of my ancestors, France. As such, you should see new posts in the next few days. There are a number of things I've got in mind, and with the CCP vs. The Community crisis unfolding as we speak, I've got plenty to talk about. Amongst other things I want to put together a list of links and howtos for new players, aggregate the various ship set-ups I've written about, and do some more 'in-character' posts. And for additional videos throughout this blog, simply do a label search under "video".